"Soon you will learn to appreciate me." X-Wing™ Second Edition blasts into its first major competitive event at the 2018 Coruscant Invitational! 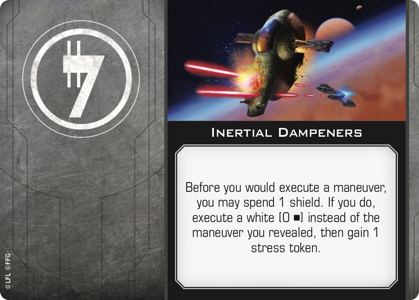 Scheduled for the weekend of October 5th – 7th, the Coruscant Invitational is the capstone of the 2018 X-Wing System Open Series. 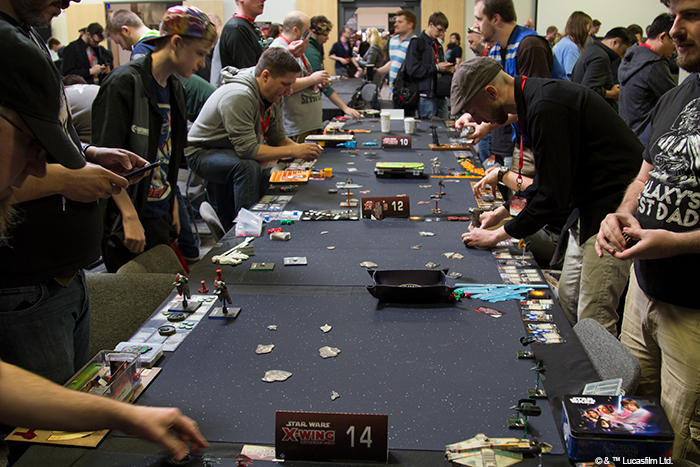 Invitees will converge on the Fantasy Flight Games Center from all across the globe to lock in their dials, execute their maneuvers, acquire their targets, and vie for the title of 2018 Coruscant Invitational Champion. Participants will fly to battle in games where clever maneuvering means more than ever before. They'll use the Force. And they'll assemble squadrons that reflect the newly reinforced Rebel, Imperial, and Scum faction identities. 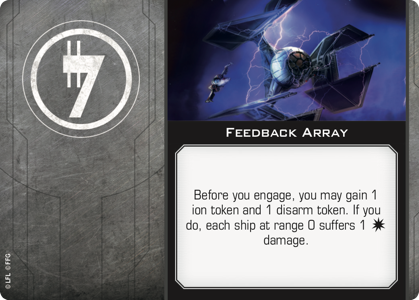 In fact, these squadrons will reflect the "essential" nature of their respective factions as much as any X-Wing squadrons ever have, and for one reason—you, the community, will have selected one "essential" upgrade for each faction, an upgrade that must feature in every squadron in that faction! Over the past couple of weeks, we've looked at the Rebel-only upgrades from the Rebel Alliance Conversion Kit and the Imperial-only upgrades from the Galactic Empire Conversion Kit. 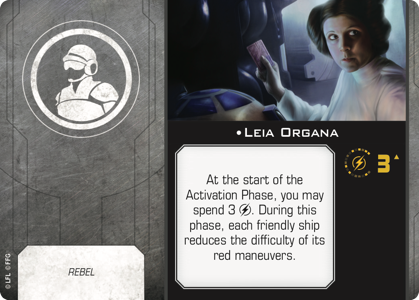 You cast your votes, and you selected Leia Organa as the "essential" Rebel upgrade and Ruthless as the "essential" Imperial upgrade.Today, we invite you to cast your votes for the "essential" Scum upgrade, and to make sure you'll be properly informed when you cast your vote, we'll start with a look at the Scum and Villainy Conversion Kit! While the Galactic Civil War and its battles spread from world to world, dividing the galaxy's citizens between the Galactic Empire and the Rebel Alliance, there were some who avoided letting themselves be drawn in. They stayed in the shadows and hung back at the fringes, opting out of the ideological conflicts—choosing only to involve themselves in matters of business. It wasn't an easy thing to do—avoiding involvement. The Galactic Civil War raged across countless star systems and represented a real crisis—a true fight for the fate of the galaxy. On one side, you had the Galactic Empire and its oppressive law and order, ruling by fear and military might. On the other side, you had the ragtag Rebel Alliance, sorely outmatched, but forever hopeful, fighting for the cause of freedom and inspiring worlds everywhere to rise up and fight against injustice. But the mercenaries, pirates, bounty hunters, and crime lords didn't concern themselves with the Empire's law or the Rebellion's freedom. They had always found ways to live outside the galaxy's laws, and freedom didn't pay as well as crime. So they stuck with their smuggling and gambling. They continued to traffic in illicit goods and services. They honed their skills and kept alert; in a business where nothing is legal, everything is permitted, and that means loyalty can be bought… and lost. 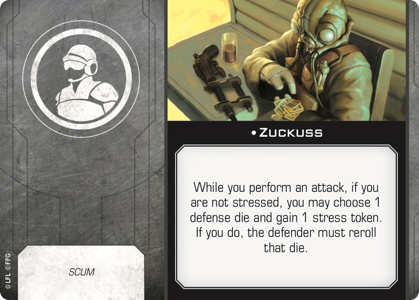 In X-Wing Second Edition, these Scum are every bit as self-serving and scummy as you could hope. 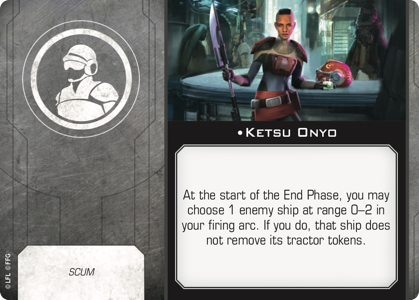 Among the 99 ship cards and 167 upgrades in the Scum and Villainy Conversion Kit, you'll find plenty of ways these characters aim to keep themselves one step ahead of their competition—and their current allies. Who Are the Galaxy's Scum and Villainy? 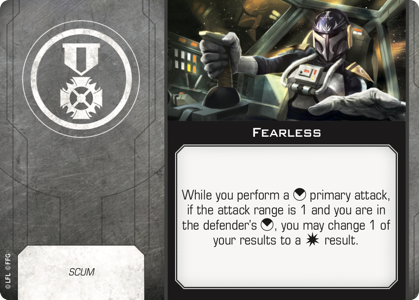 When we reviewed the faction-specific upgrades from the Rebel Alliance Conversion Kit, we found plenty of abilities that reflected the faction's heroic selflessness. We also found plenty of abilities rooted in clever leadership and dedicated teamwork. Then we saw how the Galactic Empire Conversion Kit and its upgrades played to the strengths of the Empire's superior numbers and swarm tactics, and we saw how they reinforced the focus provided by the Imperial Navy's chain of command. By contrast, the Scum don't take well to self-sacrifice or orders from their superior officers. They prefer looking out for themselves and their bottom lines and negotiating their contracts toward those ends. Accordingly, many of their upgrade abilities center around the sorts of risks and rewards that drive economics, and many of these risks and rewards come in the form of stress and damage. 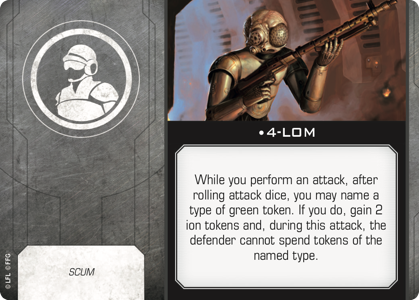 Of the 167 upgrades in the Scum and Villainy Conversion Kit, 24 are unique to the Scum and Villainy faction. This includes nine title upgrades, twelve crew upgrades, four gunners, three astromechs, and three copies of the talent, Fearless. 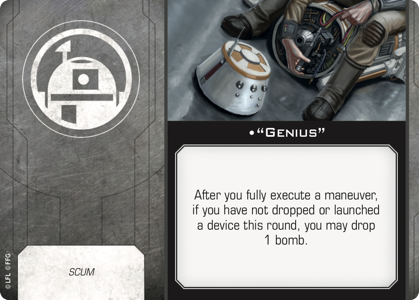 Each Conversion Kit in the first wave of X-Wing Second Edition expansions comes with three copies of a faction-specific talent. 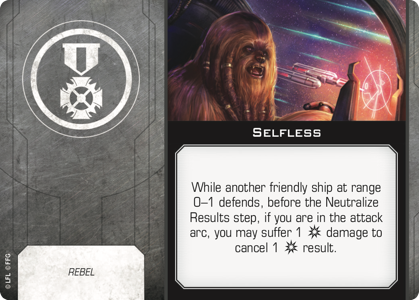 The Rebels get Selfless, which allows pilots to absorb damage meant for their wingmates, preventing your opponents from concentrating their fire at full strength. 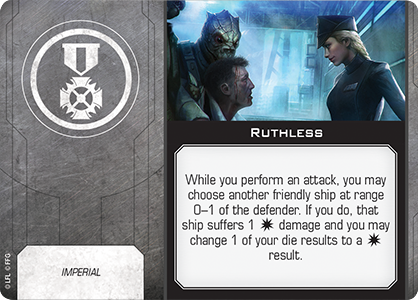 The Imperials get Ruthless, which allows their pilots to damage their wingmates to convert their misses into hits. As you can see above, the Scum get Fearless, which also allows their pilots to convert their misses into hits, but only if they fly squarely into their opponent's forward firing arc at range 1. 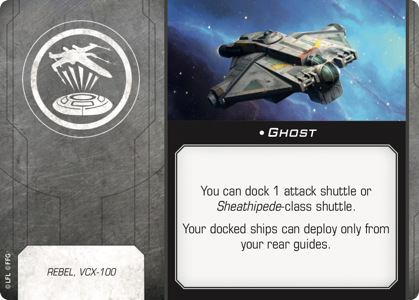 While it's entirely possible your Scum and Villainy pilots might finish off their opponents fast, or that your opponent may have rotated a turret firing arc out of position, it's also just as likely that flying straight into an X-wing's primary firing arc—or that of a VCX-100 like the Ghost —may see your fighter crippled or destroyed in the return volley. But that's how the Scum play this game—high-risk and high potential reward. 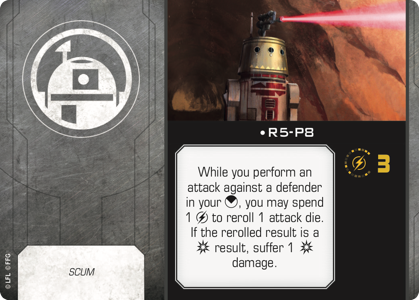 The same perspective on risk and reward features prominently on the Scum-only astromech R5-P8. 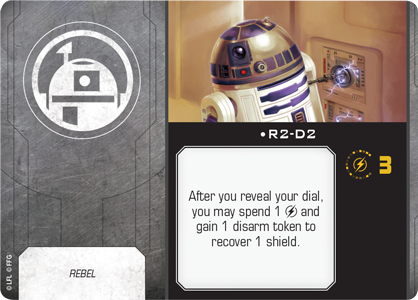 This droid comes with three charges that you can spend to reroll dice whenever you make attacks against foes in your forward firing arc. 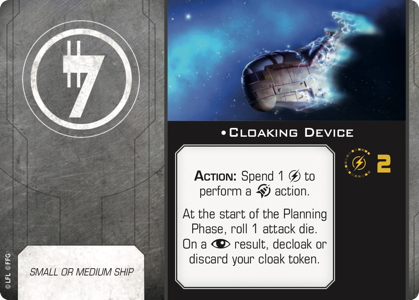 Given how valuable—and rare—action-free dice modifications are in X-Wing Second Edition, this ability catches the eye immediately. However, R5-P8's ability also comes with a nasty potential price. If your rerolled result is a critical hit, then you must suffer a critical hit as well! 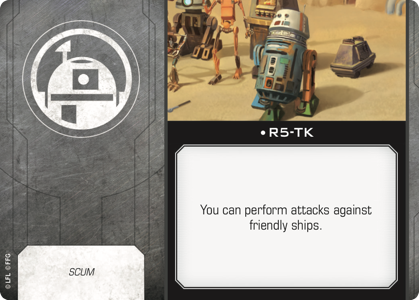 Because of how neatly R5-P8 plays into the faction's balance of high-risk abilities with high potential rewards, we're setting him ahead of fellow astromechs "Genius" and R5-TK, and you will—if you choose—be able to vote for R5-P8 as the card you'd like to see every Scum player use at the 2018 Coruscant Invitational. 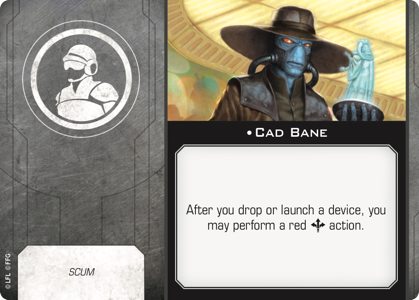 As we move from the Scum-specific astromechs to their signature gunners, we find a trio of notable bounty hunters and an assassin droid from the Darth Vader and Doctor Aphra comics. Often seen as the dark counterpart to R2-D2 , BT-1 has quickly become a fan-favorite character and frequently appears in the comics accompanied by his droid companion, 0-0-0. Even though he's dangerously homicidal and packs a surprisingly large and deadly arsenal—or, perhaps, because of those things—BT-1 has proven a powerful ally to the humans he has served and hasn't killed, namely Darth Vader and Doctor Aphra. 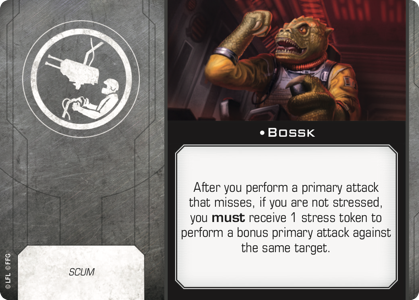 BT-1 is similarly lethal in X-Wing Second Edition, where he adds to the Scum faction's unique take on granting, spending, and taking advantage of stress tokens. 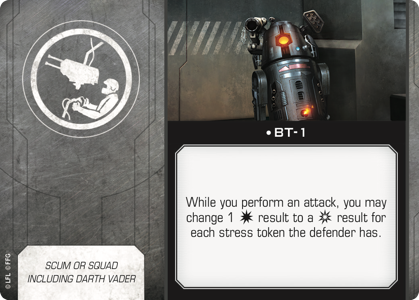 Whenever his ship performs an attack, BT-1 allows you to convert a number of hit results to critical hits up to the number of stress tokens on the defender. The other Scum-only gunners include bounty hunters, Bossk, Dengar, and Greedo, all of whom received some memorable screen time in the original Star Wars trilogy. Bossk and Dengar were among the assortment of bounty hunters that Darth Vader infamously invited onto the bridge of the Executor in Star Wars: The Empire Strikes Back, but of course, it was Greedo who saw the most screen time of these three bounty hunters—only to be shot by Han Solo in the cantina at Mos Eisley. Despite his early demise, Greedo played an important role in the development of the Star Wars mythos; his pursuit of Han Solo helped establish the smuggler's checkered past and lent an extra dimension to the galaxy's conflicts. Up until Greedo's moment on-screen, the galaxy was a place divided primarily by the Galactic Civil War. But when Greedo arrived, trying to collect the bounty on Han, audiences were immediately made aware of a whole criminal realm that lay outside the law, didn't care about the rebellion, and exerted influence throughout multiple star systems. As a gunner in X-Wing, Greedo's ability recalls his brief appearance in the Mos Eisley cantina, even as it begs the question, "What if?" What if Greedo had shot Han, rather than the other way around? With the Greedo upgrade, you have an answer—you can spend a charge to convert a hit result into a critical hit. But in a fashion sure to please longtime fans, Greedo's charge backfires if his opponent shoots first, and the Rodian inadvertently allows his attacker to convert a hit to a critical hit. 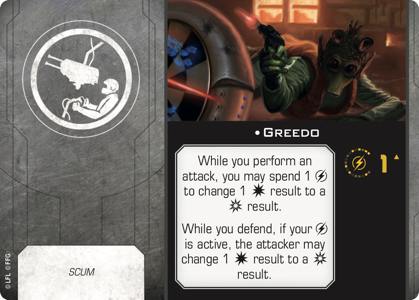 Another high-risk card with high potential reward, Greedo certainly belongs on a ship piloted by someone with high initiative. 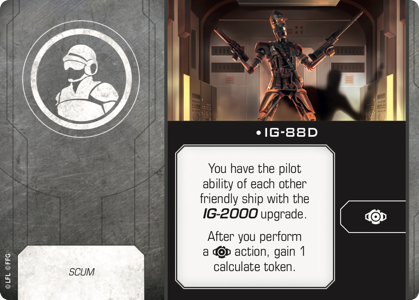 Finally, there are twelve Scum-only crew upgrades in the Scum and Villainy Conversion Kit, one of which occupies two crew slots all by itself. These crew include bounty hunters, pirates, crime lords, a junk boss, and even a protocol droid. They represent a broad swath of time, as well—the lot of them having influenced the events in the Star Wars galaxy before, during, and after the Galactic Civil War. And while many of them—like Ketsu Onyo, Cad Bane, Zuckuss, 4-LOM, IG-88D, and Maul —were remarkable for their talents, the only thing that's true about all twelve of these crew taken together is that they present the Scum faction with an array of interesting squad-building possibilities. 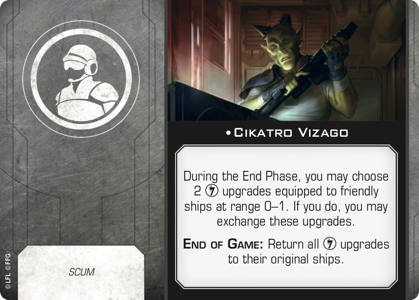 For example, Cikatro Vizago lets you swap the illicit upgrades on two friendly ships at range 0-1 during the End Phase, further complicating your opponent's efforts to guess if you'll use your Inertial Dampeners or Contraband Cybernetics, or putting you in better position to activate your Feedback Array or Deadman's Switch. 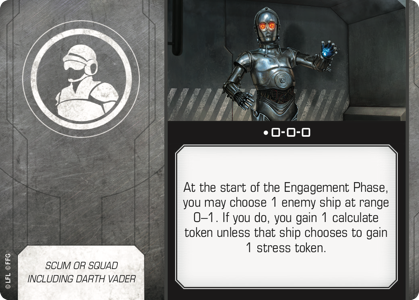 Meanwhile, the sadistic protocol droid 0-0-0 offers your opponent a twisted bargain—at the beginning of the Engagement Phase, your opponent's ship at range 0-1 can either take a stress token or give your ship a free calculate token. 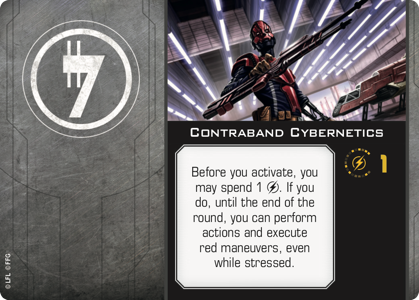 And Latts Razzi can take advantage of any stress tokens that do find their way onto your opponent's ships. 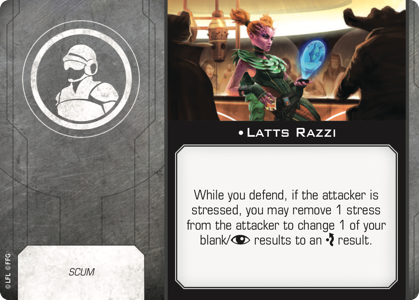 While her ship is defending, Latts Razzi can spend one of your opponent's stress tokens to convert one of her blank or focus results to an evade. Adding even more dimensions to the abilities provided by these characters, you've got the junk boss Unkar Plutt, who allows you to bump into an enemy ship and still take an action—but at the cost of a point of damage. It's an expensive ability, but one that can pay handsomely at the right moment. 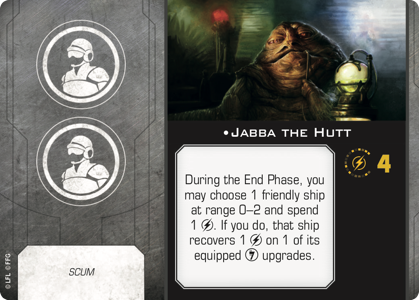 You also have Jabba the Hutt, the renowned crime lord, whose focus on illicit activities is represented in X-Wing Second Edition by his ability to spend one of his four charges in the End Phase to recover a charge on an illicit upgrade equipped to a friendly ship at range 0-2. Need your Cloaking Device recharged? Jabba knows somebody. Running into trouble with Imperial ships on your back? 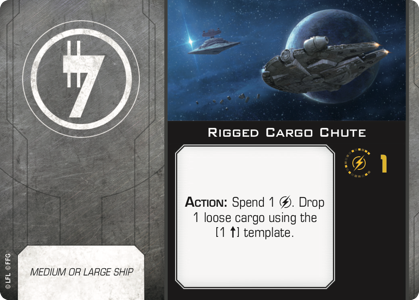 Jabba's ability could allow you to recharge your Rigged Cargo Chute as many as four times, making it possible to choke off nearly every flight lane on the board! While Jabba the Hutt would certainly be a worthy candidate for the "essential" Scum upgrade vote, we're going instead with another fan-favorite character—Mandalorian bounty hunter Boba Fett. It's true that if you vote for Boba Fett, you won't see him piloting any ships at the 2018 Coruscant Invitational, but you will instead see him promote one of the second edition's newer mechanics—the ability to place ships in reserve. 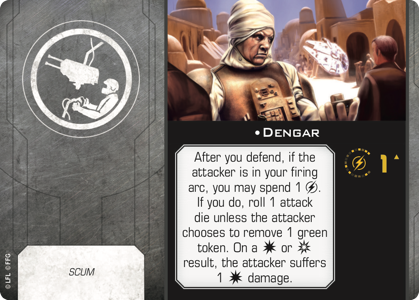 Ships that are placed in reserve are placed on their ship cards and are inactive for all purposes, except when targeted by an ability like Boba Fett's. 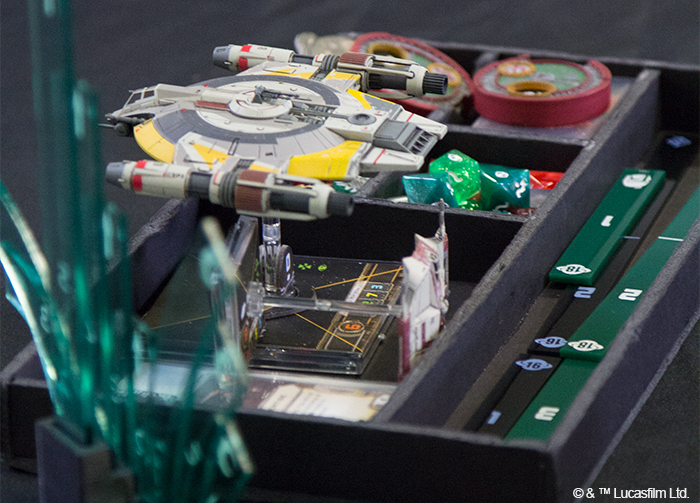 During setup, Boba Fett pulls his ship off the board until all obstacles and other ships have been placed. Then, with a clear view of his enemy's position, Boba Fett can pull his ship adjacent to an obstacle and beyond range 3 of any enemy ship. 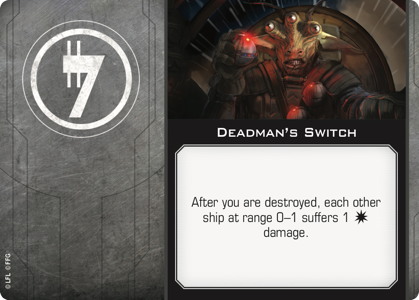 He can start facing your opponent's ships, ready to swoop in for an early shot, or he can start on a ship that's ready to bolt away, dropping loose cargo right in your opponent's preferred flight path. Either way, he helps you get the drop on your enemies. 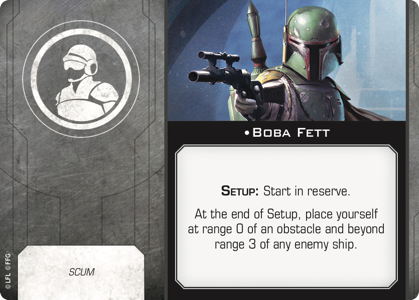 We're happy to include Boba Fett as one of the options for the "essential" Scum upgrades. What's Your Kind of Scum? Over the last couple of weeks, you cast your votes for the "essential" Rebel and Imperial upgrades. 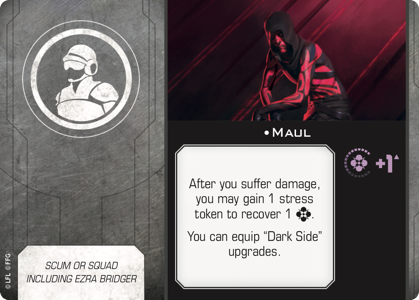 Now's your chance to select the final piece of the puzzle that is the 2018 Coruscant Invitational—which upgrade will appear in every Scum and Villainy list at the event? Which card do you feel best embodies the faction in the game? Which speaks to the essence of the Scum faction like Leia Organa speaks to the essential nature of the Rebel Alliance and Ruthless speaks to the essence of the Imperial Navy? Head to Twitter @FFGOP to cast your vote now. Then, be sure to check back next week when we reveal the results of this final poll and take a look at what it means for the ships and pilots we might expect to see on the livestream at the 2018 Coruscant Invitational!